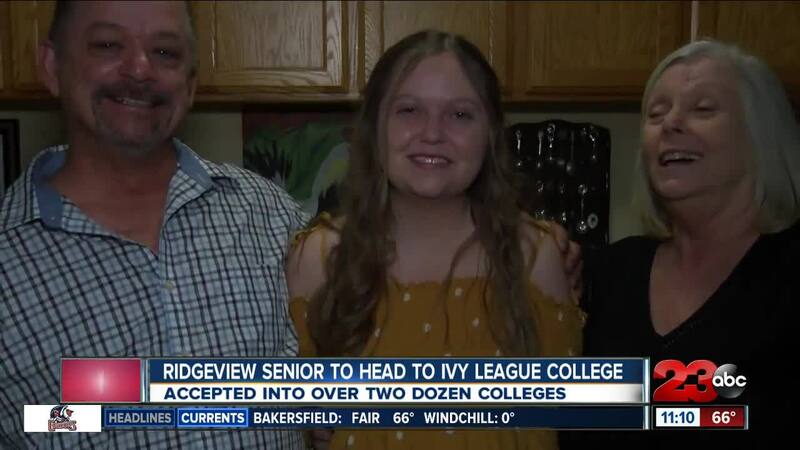 BAKERSFIELD, Calif. — Ridgeview senior Brianna Camero will head to the University of Pennsylvania this August after years of hard work. Camero was accepted into over two dozen colleges before deciding on the Ivy League college. "I didn’t even tell my parents that I was opening the decision letter because I really thought it was something that wasn’t really possible, even though I dreamed of it happening my whole life," said Camero. Camero was a apart of her school's tennis, softball and mock trial team, among many other extracurricular activities, as well as maintained a 4.5 G.P.A. “I don’t know if I can [describe] how proud I am of her," said Brianna's father, Robert. "I'm just a high school educated man. I work in the oil fields. To watch her dreams come true, was my dream." Brianna will head to the University of Pennsylvania this August and study counter-terrorism and criminology.